FORT WORTH, Texas (Nov. 14, 2016) – A trio of semifinalists for the Davey O’Brien National Quarterback Award as well as three first-time weekly award winners are among the Davey O’Brien “Great 8” honorees for Week 11. The eight honorees, as determined by voting from the award’s selection subcommittee, include: USC’s Sam Darnold, Luke Falk of Washington State, USF’s Quinton Flowers, Jalen Hurts of Alabama, UNLV’s Kurt Palandech, Shea Patterson of Ole Miss, Pittsburgh’s Nathan Peterman and Will Worth of Navy. Falk and Hurts each appear on the “Great 8” list for the fifth time in 2016, which is tied for the second most by any player in the country. Flowers, Darnold and Worth are each listed for the third time. Meanwhile, Palandech, Patterson and Peterman are first-time honorees. All FBS quarterbacks are eligible for the weekly honor. 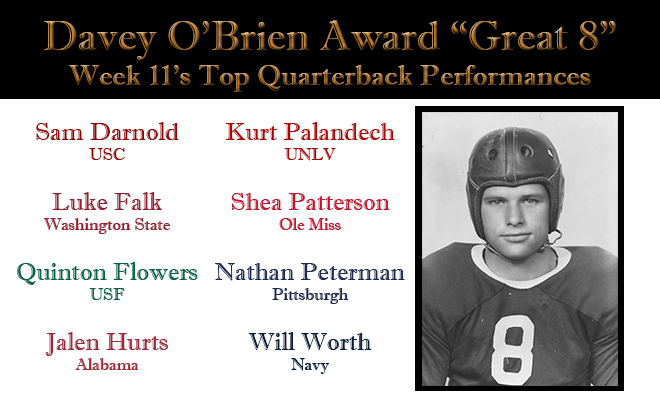 The winner of the Davey O’Brien Quarterback of the Week Award, which will be one of the week’s “Great 8” quarterbacks, will be announced Tuesday. Guided USC to a 26-13 upset of previously unbeaten and fourth-ranked Washington by throwing for 287 yards and two touchdowns (23 of 33). Connected on 36 of 50 passes for 373 yards, including five touchdown strikes, in the team’s seventh straight win, a 56-21 triumph over California. Quinton Flowers, USF, Jr., 6-0, 210, Miami, Fla.
Had 473 yards of total offense (263 passing, 210 rushing) and five touchdowns (two passing, three rushing) against Memphis in a 49-42 victory. Set career highs in passing yards (347) and passing touchdowns (four) and also added 100 rushing yards and a score in a 51-3 victory over Mississippi State. Kurt Palandech, UNLV, Jr. 6-2, 185, Plainfield, Ill.
Was 20 of 32 passing for a career-high 252 yards and three touchdowns, and rushed for 157 yards and a score, in a 69-66 triple-overtime win over Wyoming. Shea Patterson, Ole Miss, Fr., 6-2, 200, Shreveport, La. Impressed in collegiate debut, leading Rebels to a 29-28 win over No. 8 Texas A&M by throwing for 338 yards and two scores (25-for-42) and rushing for 64 yards. Nathan Peterman, Pittsburgh, Sr., 6-2, 225, Jacksonville, Fla. Completed 22 of 37 pass attempts for 308 yards and a career-best five touchdowns against no interceptions in Pitt’s 43-42 upset of No. 2 Clemson. Rushed 26 times for 122 yards and three touchdowns and was 6-for-8 passing for 111 yards and a score in a 42-40 victory over Tulsa.